I actually didn’t think we would have any view of the strip when we checked in. We were pleased with the view that we did have. 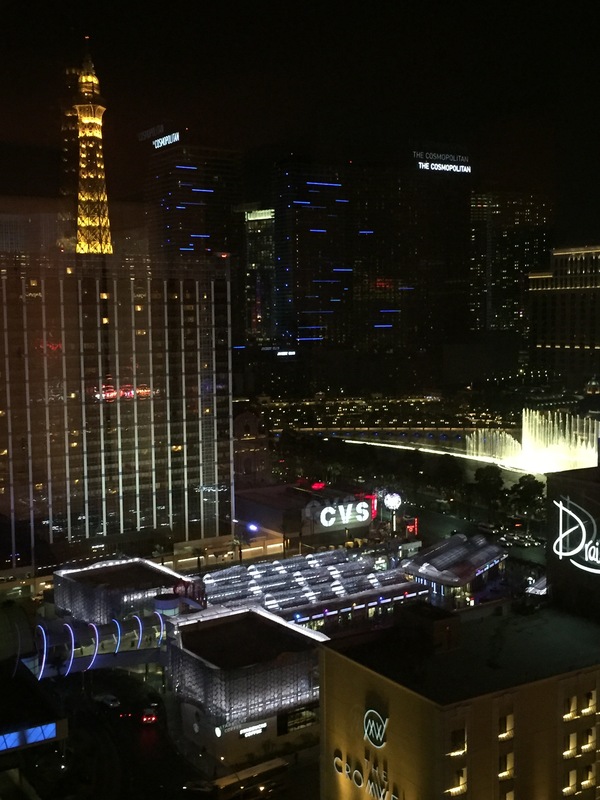 It was relaxing to look out the window at Paris, Las Vegas, to see the dancing fountains of the Bellagio that are especially impressive at night from the top of the Eiffel Tower. It was a great get-a-way. On our last day, walking back to our hotel through busy streets of people–some that had noticeably exceeded their alcohol limits–I felt ready to leave this bustling city. Yet here I am, missing it already, planning our next trip in my mind. rest upon my senses, pulling me in different directions. Nature far off in the background, still in sight, offering a reminder–a sense of grounding and perspective. The first time that I visited Las Vegas I was somewhere in my twenties. It was with a good friend, whose mom was nice enough to pay for all expenses. It was a family affair. The three of us shared a room at the Mirage. I remembered that hotel for it’s tropical feel; at least there was a bit of nature in this very built up, over-the-top destination. My memory is fuzzy of how I actually felt, what my feelings were in response to all of the “noise” but my sense is that, at times, it was overwhelming. As a person who appreciates her solitude, it was the sort of place that went against my natural disposition. For years I convinced myself that Las Vegas was not for me and that I wouldn’t visit again. I believe that I did end up there a second time with the same family in the same hotel and that this time, the flashy city did began to grow on me. Fast-forward roughly twenty years and its one of the destinations that hubby and I would venture to for a short getaway. He is an extrovert through and through and I think because of him I try to find places that he’ll be able to enjoy and that I’ll be able to explore and revisit. Because of him, the layers of my introvertedness are beginning to peel away to reveal more tolerance and more enjoyment of my extroverted side. I still enjoy my quiet time, but I’m able to feed off of noise a lot better and am able to find the quiet within the chaos. We’ll be visiting the Las Vegas Strip again soon to take in the glitz. I love walking through the gorgeous hotels, admiring the architecture, people watching, catching a few shows, and being right in the middle of all of the action. One of my favorite parts is planning the trip, researching the different restaurants, and trying to get a feel ahead of time for potential places to eat and things to do. I know that there’s more to Las Vegas than the Strip, but I have grown a great fondness for this piece of Las Vegas set against its beautiful desert landscape.